This Iowa mom uses a scooter. This Olympian vaults hurdles. A rare condition links them. Jill Viles (with her son, Martin) uses an electric scooter to get around. Patricia Lopes-Schliep is a world-class hurdler. The women have discovered they share a rare muscle condition. For Viles, it’s part of the reason she can no longer walk. For Lopes-Schliep, it’s one reason for her dominance on the track. Image via the Toronto Star. 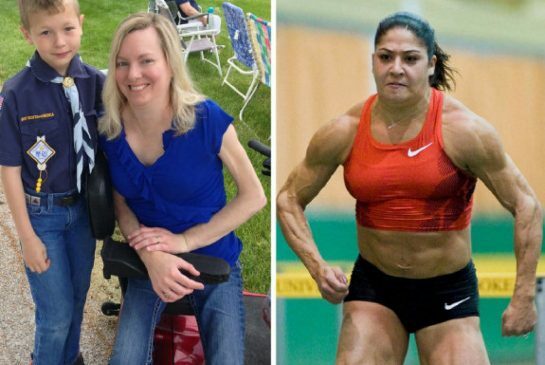 The idea seemed ludicrous: A muscle-bound world-class athlete and an Iowa mom with arms and legs reduced to sticks, sharing the same rare muscle condition. But doctors had been wrong before about Viles, who lost use of her legs several years ago. And the more she examined photos of Priscilla Lopes-Schliep, a Canadian who won bronze in 2008, the more she began to think her sister was right. But did they really share a genetic hiccup? And if so, why did it put Jill Viles into a motorized scooter but made Priscilla Lopes-Schliep a track champion? The search for answers led Viles onto another leg of an already remarkable tale of discovery. It’s a science story, but also a human-interest story that has gotten attention from across America and around the world. The quest goes on. Viles is seeking donations to support research into the differences and similarities between her and Lopes-Schliep – the anti-Jill Viles – with the hope it could lead to new therapies, even for those suffering from more common muscle conditions. With enough donations, Viles also hopes to help others travel to consult with the world’s leading expert in her condition. The zombie garden tractor gets your attention. The driverless machine can move through rows of sorghum, going for hours with only a GPS navigation brain to guide it. High-tech cameras, meanwhile, take three-dimensional photos of every sorghum plant it passes – a kind of Google Street View for fields. 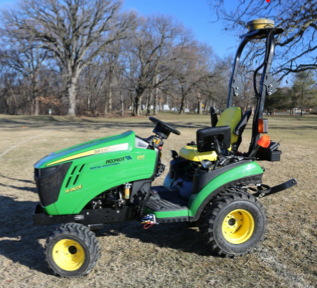 More importantly, the unmanned machine represents Iowa State University’s push into phenomics, a research frontier that promises to reshape the way we grow the food and substances we count on. Just as genomics researchers aim to understand a plant’s total genetic makeup – every letter in the long book of its DNA – and how it influences plant development, phenomics aims to understand plant phenotypes in similar depth. A phenotype is the way an organism grows, appears and performs, given its genetic makeup, the environment it lives in, and how the two interact. “What’s cool – and this is what makes it most interesting to me – is the interaction between genetics and environment,” said Patrick Schnable, an ISU distinguished professor of genetics. Schnable leads ISU’s drive into phenomics research. He took over as director of the Plant Sciences Institute (PSI) in February with the charge to bring it (and the university) to international prominence in one or more research areas.